Government House Complex features one of the largest and most beautiful mansion houses in Australia. Built between 1872 and 1876, the complex consists of the main house, outbuildings and substantial 19th century grounds. The main building consists of three parts: the extravagant single storey State Ballroom occupying the entire south wing; the three storey State rooms with their grand staircase hall; and the lavishly decorated two storey vice-regal apartments to the north. The different parts are unified by the richly decorated crowning cornice that continues round the whole building, carrying a finely detailed balustrade supporting urns, and by the porte-cochere and porticos which feature Doric orders. The building's most notable and instantly recognisable feature is its 145 foot tower, which consists of a plain shaft crowned by a finely detailed belvedere. Service quarters to the east of the main house consist of a large paved yard surrounded on three sides by a colonnaded verandah sheltering living quarters for the staff. Nearby are the mews, a paved area surrounded on three sides by stables, coach houses and living quarters. These outbuildings are an integral part of the complex but are architecturally attractive in their own right. The gardens were laid out at the time of the construction of the house and contain many fine mature trees. Their 19th century English character is still clearly evident. Government House Complex is of historical, architectural and aesthetic significance to the State of Victoria. 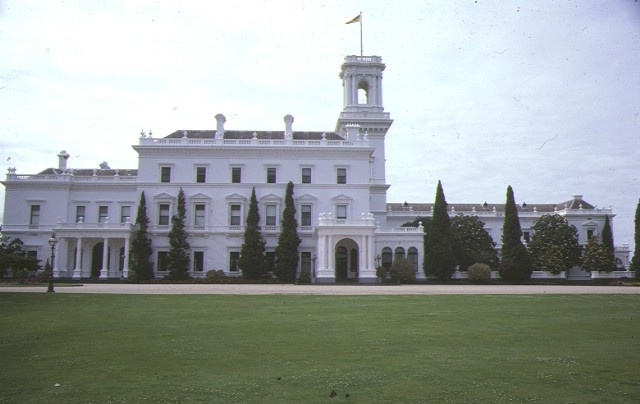 Government House Complex is of historical significance for its role in the vice-regal history of Victoria and Australia. The house served as the residence of the State's Governor from 1876 to 1902 and from 1934 to the present day. It was the first purpose-built Government House, replacing the much smaller Toorak House, and its grandeur and size reflect the confidence and burgeoning wealth of the colony as a result of the gold rushes. After Federation of the Australian colonies in 1901, the house served as the residence of the Governor General of Australia, until the establishment of Canberra as the nation's capital in 1926. The continuing vice-regal use of the complex and the substantial intactness of its outbuildings and grounds provide an excellent illustration of the character of a 19th century governor's residence. The house's elaborate interiors, as well as the stables, servant accommodation and other outbuildings provide evidence of the kind of lifestyle enjoyed by 19th and early 20th century elites. Government House Complex is of architectural significance as one of the grandest and largest residences, and one of the finest examples of 19th century residential architecture, in Australia. The three components of the house, the State, Private, and Ballroom wings, are expressed in a grand composition articulated by the belvedere tower, which has itself become a prominent Melbourne landmark and symbol. Designed in the conservative classical style, the superb Italianate composition appears to have been inspired by Queen Victoria's Osborne House on the Isle of Wight. The house features a rich variety of fine mouldings and other decoration, and the interiors are among the grandest in Melbourne. Government House Complex is of architectural significance as the work of William Wardell, assisted by J.J. Clark and P. Kerr, all of the Public Works Department. Wardell (1823-1899) was the Inspector-General of Public Works in Victoria when he designed Government House. Whilst Government House is one of his most substantial and distinguished buildings, he is perhaps chiefly known as a talented exponent of the Gothic Revival style. Other important buildings designed by Wardell include St Patrick's Cathedral, St John's Church of England, Toorak and the Gothic Bank on the corner of Collins and Queen Streets. Government House complex is of aesthetic significance for its garden, which is possibly the most intact 19th century mansion garden remaining in Melbourne. The garden generally conforms to the original design by amateur designer John Sayce of 1873, which is well documented. The garden is especially significant in that the utilitarian areas remain relatively intact, although the kitchen gardens recently ceased operations. The garden's significance is accentuated by its association with William Guilfoyle, curator of the Melbourne Botanic Gardens, who refined and helped to implement Sayce's design. The design modifications recommended by Guilfoyle are well documented and his plan (superimposed in red on Sayce's plan), reports and sketches give insight into his design philosophy at the time he commenced work at the Botanic Gardens. The garden's aesthetic significance additionally derives from its close relationship to the Botanic Gardens and Domain, which are designed to be mutually complementary. The garden contains many fine mature trees, including conifers, Australian rainforest species and deciduous trees, which are characteristic of the era and which also reflect Guilfoyle's personal taste. There have been five vice-regal residences in Victoria. The first was virtually a wattle and daub hut, erected on the north-east corner of Little Collins and Spencer Streets in 1837, and used by the Police Magistrate and Commandant of Troops for the Port Phillip District, Captain Lonsdale. Lonsdale's successor, C. J. La Trobe, erected his house, a pre-fabricated timber structure imported from England, in 1840 in Jolimont. La Trobe became Lieutenant-Governor of Victoria after separation from NSW in 1851 and by 1854 a grander Government House was being sought for the burgeoning colony. Accordingly, Toorak House was leased in 1854, and served as the vice-regal residence until the construction of Government House in 1876. Government House has served as the Governor's residence ever since, except for the period between 1901 and 1931, when it functioned as the residence of the Governor General of Australia, and Stonnington in Malvern housed the State's Governors. There was a brief hiatus in vice-regal occupation, between 1930 and 1934, when the Ballroom and State Drawing Room were used as classrooms for the Melbourne Girls High School. General maintenance works where 'maintenance' means continuous protective care without causing any damage to the existing fabric or the introduction of new materials. Traditional finishes such as oils and waxes must continue to be used for timber surfaces rather than modern alternative protective coatings such as polyurethane or acrylic which may seal the surface and cause damage. Surface patina which has developed on the fabric may be an important part of the item's significance and if so needs to be preserved during maintenance and cleaning. Cleaning including the removal of surface deposits, organic growths or graffiti by the use of low pressure water (less than 100 psi at the surface being cleaned) and neutral detergents and mild brushing and scrubbing. Surface patina which has developed on the fabric may be an important part of the item's significance and if so needs to be preserved during maintenance and cleaning. For more information see Heritage Victoria's Technical booklet 'Cleaning Masonry'. Repair, which is minor in nature, such as refixing and patching or the replacement of missing, damaged or deteriorated fabric that is beyond further maintenance, which matches the existing fabric in appearance, material (including mortar, render and timber species) and method of fixing and does not involve damage to or the removal of significant fabric. Repairs should be carried out by tradespeople experienced in the conservation of heritage fabric. This exemption is not intended to allow the cumulative replacement of large amounts or a high proportion of the fabric of a place or item. If replacement of large amounts of fabric is necessary a permit will be required. Repairs must be based on the principle of doing as little as is necessary to retain and protect the element. Therefore replacement must only occur as a last resort where the major part of an element has decayed beyond further maintenance. Repair must maximise protection and retention of fabric and include the conservation of existing detailing, such as vents, capping, chimneys, carving, decoration or glazing. The replacement of services such as cabling, plumbing, wiring and fire services that use existing service routes, cavities or voids or replaces existing surface mounted services and does not involve damage to or the removal of significant fabric. Internal and external repainting in the same colour and paint type as currently exists, where the existing is appropriate historically. Internal and external repainting in a different colour scheme or paint type provided details are submitted to and approved by the Executive Director prior to the commencement of works. Preference should be given to the re-establishment of historically significant paint schemes. This exemption does not apply where it would involve applying an inappropriate finish, painting over an early exposed decorative scheme or where the registered place is particularly significant for its painted or decorative finishes (check the statement of significance for the registered place), or where previous layers of paint are mostly undisturbed and repainting would involve the loss of these earlier layers. The painting of surfaces not previously painted requires a permit. The erection of a real estate sign with dimensions no larger than 3 metres by 4 metres indicating that the place is for auction, sale or let and removed within 21 days of sale or let of the place. Such a sign is to be erected for no more than 3 months unless otherwise agreed by the Executive Director. must not conceal or involve the removal of signage which has an integral relationship with the significance of the place; must be located and be of a suitable size so as not to obscure or damage significant fabric of the place; must be able to be later removed without causing damage to the significant fabric of the place; and where attaching to the registered building reuse existing fixing points or insert fixings within existing joints without damage to adjacent masonry. Conservation works in accordance with a conservation policy or plan already endorsed by the Executive Director. Where there is no pre-existing conservation policy or plan, conservation works may be provided with an exemption provided the details are first submitted to and approved by the Executive Director. A conservation policy or plan is a document which analyses and explains the heritage significance of a place and provides guidelines for maintaining and enhancing the heritage significance of a place. the fit-out is largely self supporting and can be installed and removed without damaging or removing significant fabric. services are installed discretely, preferably within existing conduits or floor and wall mounted ducts. the fit-out retains the volume of larger spaces considered significant. the fit out does not damage or make new attachments to significant heritage walls, floors, ceilings and joinery. Alterations to the interior of a new building which has been constructed since the listing of the place on the Victorian Heritage Register. Such interior alterations must have no visible impact externally. The erection (for a period to be agreed with the Executive Director) of temporary security fencing, scaffolding, hoardings or surveillance systems to prevent unauthorised access or secure public safety which will not adversely affect significant fabric of the place including archaeological features. Removal of dead plants and replanting to maintain the landscape character or planting theme identified in the statement of significance provided that; where the plant is a tree or where the plant is specifically mentioned in the statement of significance/extent of registration, the Executive Director must be provided with details of the plant and the reasons for its removal prior to its removal. Where the Executive Director is satisfied that such removal is appropriate the Executive Director shall notify the applicant the proposed works are exempt from requiring a permit. Repairs, conservation and maintenance to roads and paths, edges, fences and gates, drainage and irrigation systems. Installation, removal or replacement of garden watering and garden drainage systems that occur at a distance greater than 5 metres from the canopy edge of a significant tree, plant or hedge. Pruning of trees in accordance with the Code of Practice for Powerline Clearance[Vegetation] 1996, unless they are identified as significant. Remove, destroy or lop a tree if the tree presents an immediate risk of personal injury or damage to property provided details of the works proposed are first provided to and approved by the Executive Director Heritage Victoria. (g) installation, removal or replacement of smoke detectors. Exception to the above is where the works will impact on a significant element identified in the statement of significance. A person proposing to do any works affecting significant fabric must first write to the Executive Director and describe the proposed activity. If the Executive Director is satisfied that the proposed activity meets the criteria set out in this exemption the Executive Director shall notify the applicant the proposed works are exempt from requiring a permit. (b) the temporary structure is not to be located where it could damage or endanger significant fabric including landscape or archaeological features of its curtilage or obstruct significant views of and from the heritage place. b) fire suppression activities such as fuel reduction burns, and fire control line construction, provided all significant historical and archaeological features are appropriately recognised and protected; Note: Fire management authorities should be aware of the location, extent and significance of historical and archaeological places when developing fire suppression and fire fighting strategies. The importance of places listed in the Heritage Register must be considered when strategies for fire suppression and management are being developed. A person proposing to do anything of the kind described in this exemption must first write to the Executive Director describing the proposed activity. If the Executive Director is satisfied that the proposed activity meets the criteria set out in this exemption, the Director shall notify the applicant.